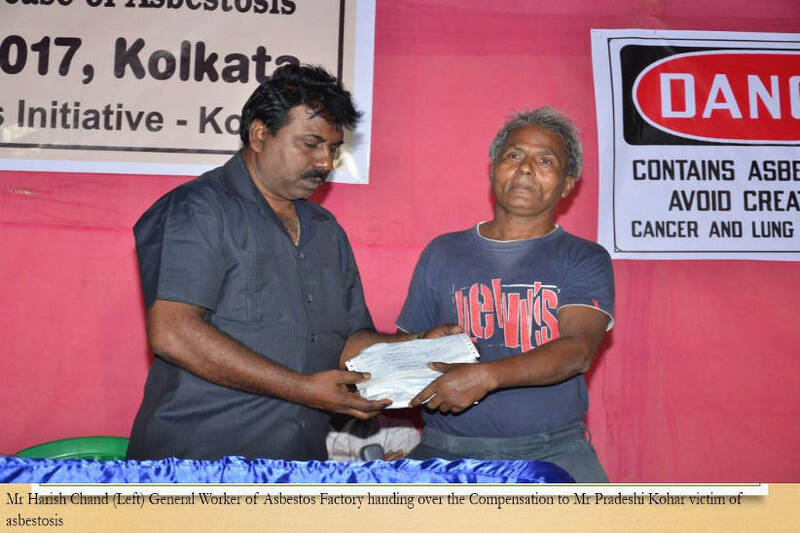 In the evening of October 27, 2017, the Workers Initiative  Kolkata organized a mass meeting in premises at Paharpur Road, Kolkata wherein 19 workers having the disease of asbestosis received compensation from the T&N Asbestos Trustee Company (UK) totaling INR 55,08,924.00 (US$ 85,000). 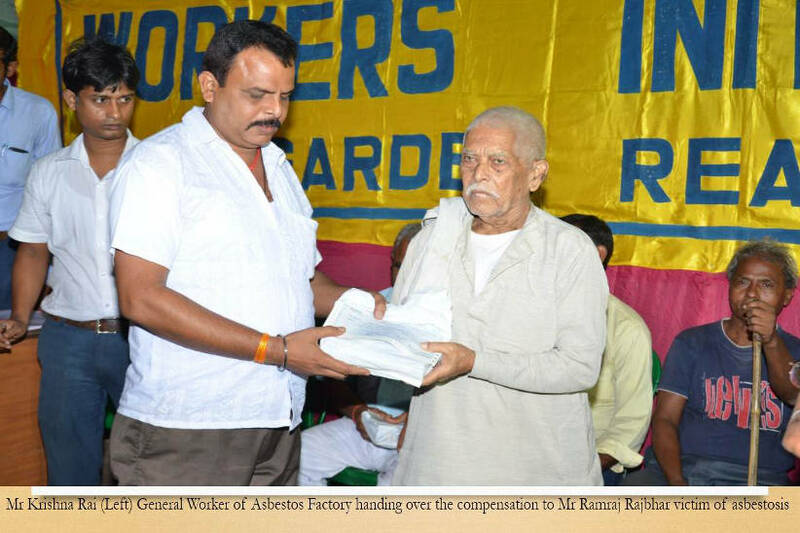 The Chairman of Borough IV of Kolkata Municipal Corporation Mr. Ranjit Sil, President of the Indian National Trade Union Congress (INTUC) West Bengal Mr. Ramen Pandey, Mr. Savio Pinto Coordinator  Kolkata of Human Right Law Network (HRLN) as well as trade union activists from different Companies like Hindustan Petroleum Corporation, Hindustan Unilever Ltd, IMC Ltd and GRSE Ltd also participated in the meeting. 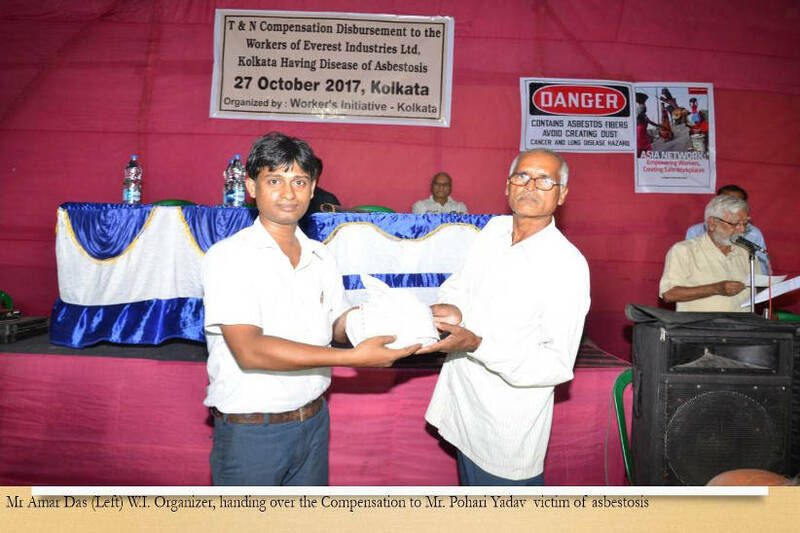 The management of Everest Industries Ltd, producer of asbestos sheeting and other asbestos products, tried to foil the meeting: the management removed the banner of the meeting from the factory to prevent the workers of its company from joining the meeting; the company cancelled night duty on October 27 and booked workers into the evening shift to prevent them attending the meeting. 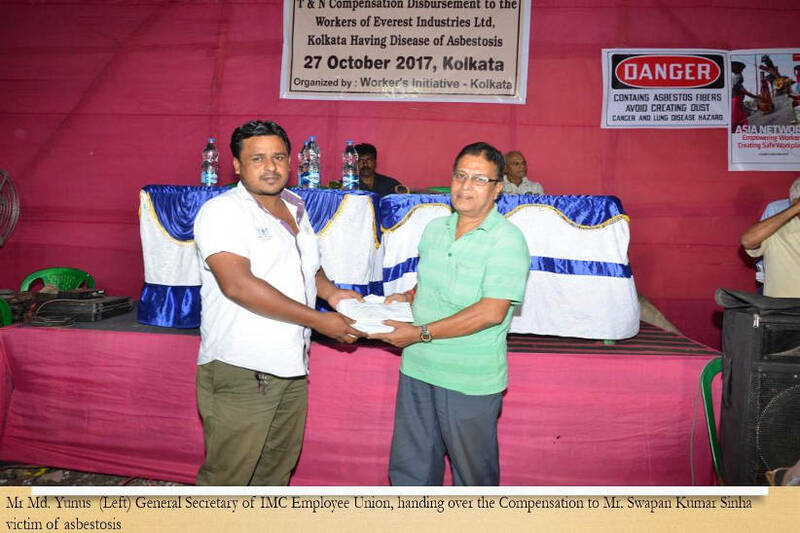 Despite all of this, many asbestos workers and hundreds of workers from different companies in the locality attended the meeting. 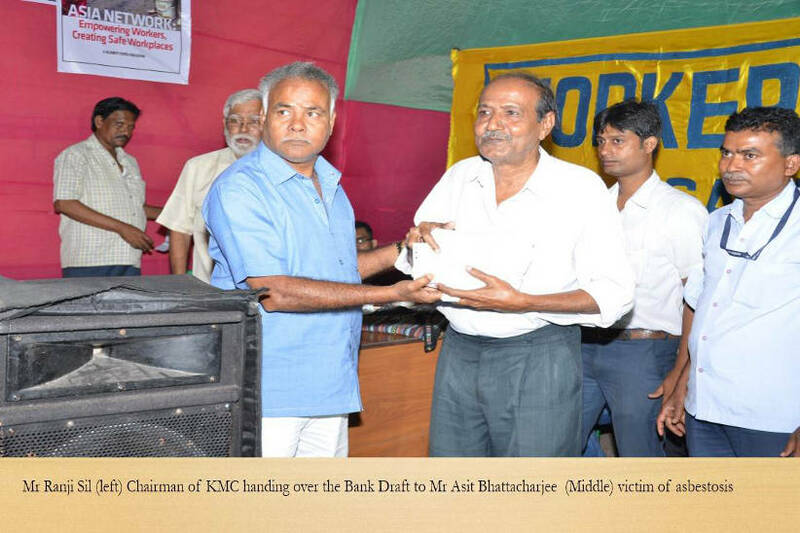 On this occasion, the Workers Initiative  Kolkata launched new leaflets in two languages i.e. 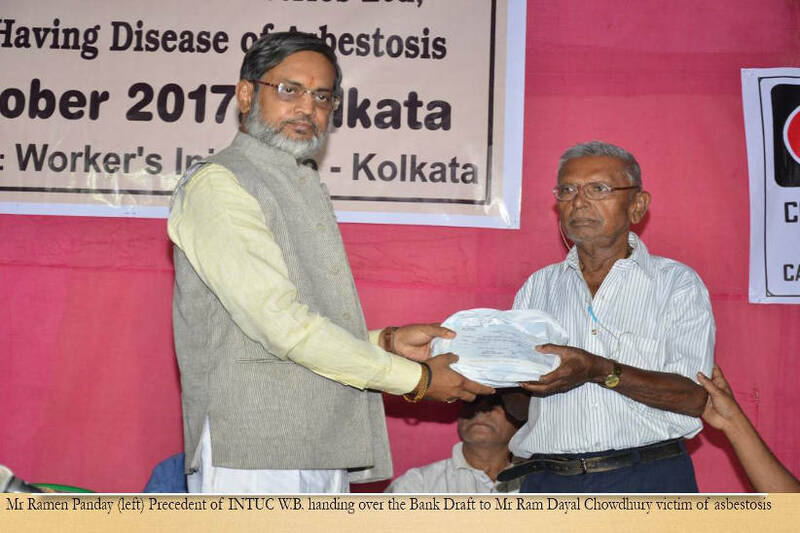 Hindi and Bengali explaining the hazards of asbestos use and processing and distributed copies of a recent order of the High Court, Calcutta wherein the Court directed the Government of West Bengal not to use asbestos sheeting in the renovation of High Court buildings. 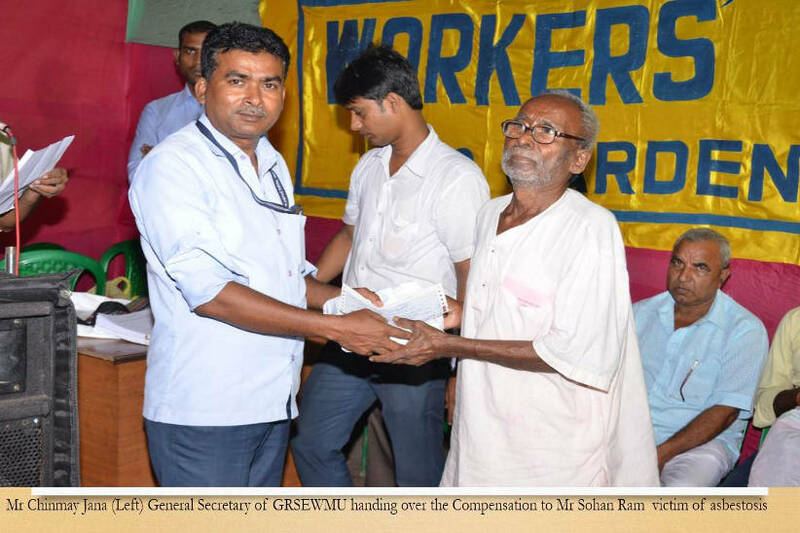 Mr. Chinmoy Jana, General Secretary of GRSE Workmens Union, welcomed guests and participants to the meeting and also explained about the dangers of manufacturing and use of asbestos products. 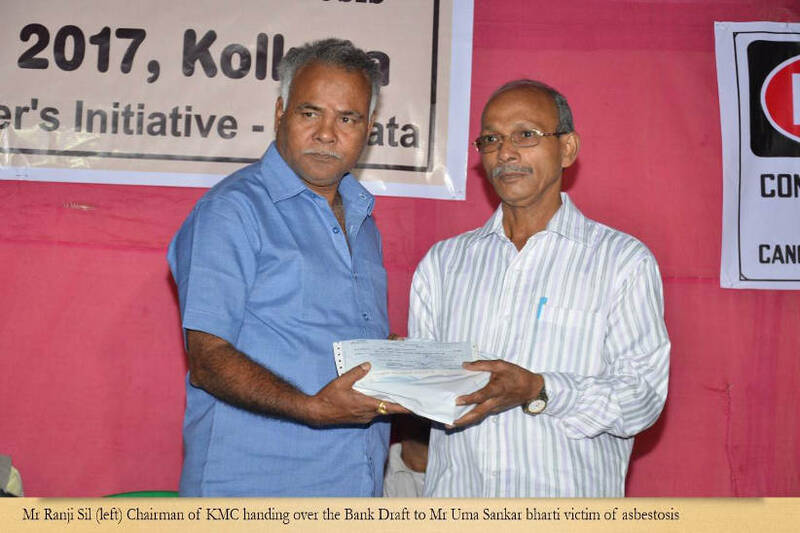 Similarly, Mr. Ranjit Sil Chairman of the Kolkata Municipal Corporation (KMC), Mr. Ramen Pandey President of Indian National Trade Union Congress  West Bengal (INTUCWB) delivered their speeches and expressed concern about the use of asbestos products. 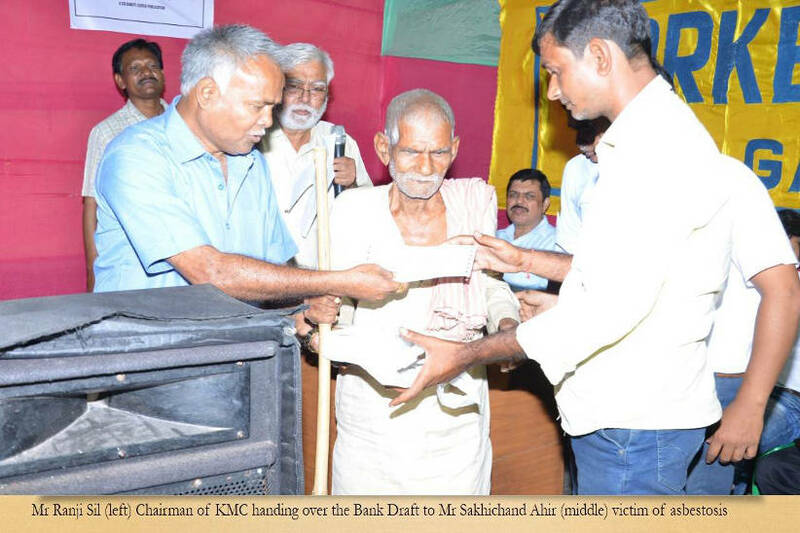 On this occasion, the first recipient received compensation from the senior-most workman of the factory Mr. Nanadlal Gond, thereafter Mr. Ranjit Sil, Chairman of Borough IV of Kolkata Municipal Corporation, Mr. Ramen Pandey President of INTUC  West Bengal, Mr. Amit Roy Chowdhury, General Secretary of Hindustan Unilever Limited (HUL) Permanent Workmens Union, Mr. Sk Md Yunus, General Secretary of IMC Employees Union, Mr. Chinmoy Jana General Secretary of GRSE Workmens Union , Mr. Amar Das organizer of WI, Mr. Krishna Rai, Mr. Hrish Chand general worker of Everest Industries distributed the compensation to all the 19 victims of asbestosis. 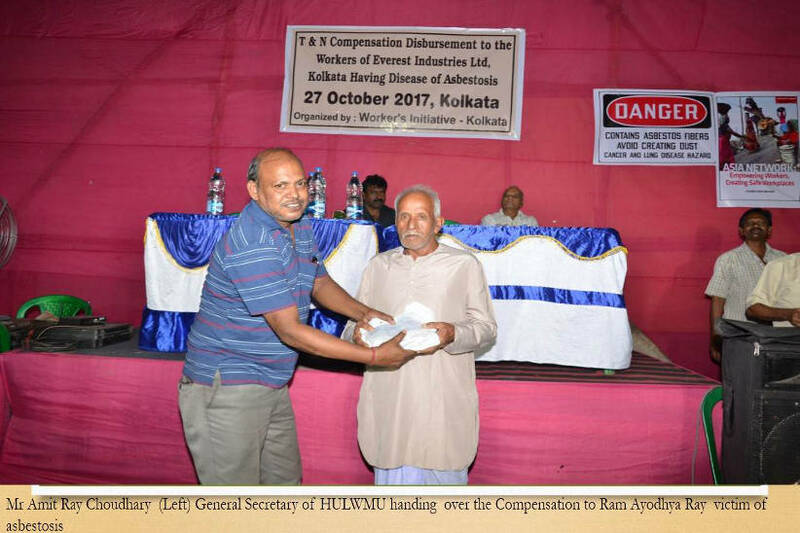 Concluding the meeting Mr. Kamal Tewary thanked all the participants and condemned the manufacturing and use of asbestos. 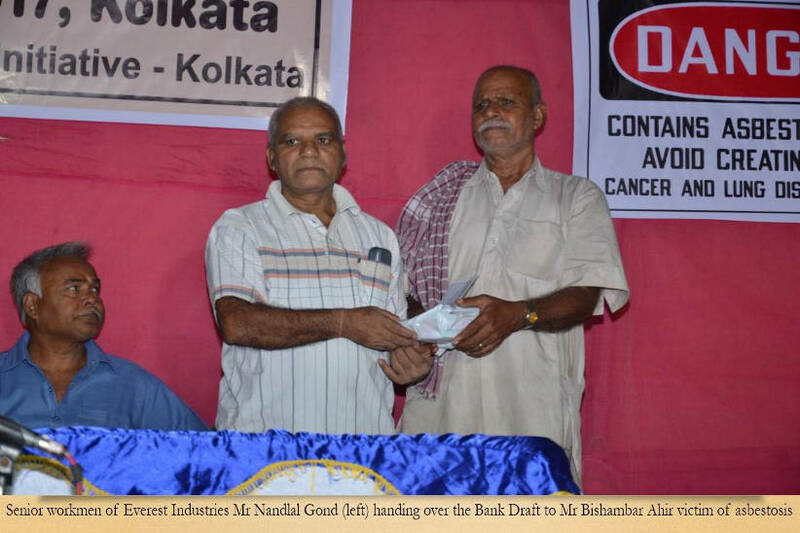 In his remarks, Mr. Tewary emphasized that a) the Government should ban production and usage of asbestos b) the management of asbestos companies should convert manufacturing operations from asbestos to non-asbestos technology c) the management of asbestos companies should accept responsibilities for the health and safety of all employees and d) workers of all asbestos companies must take an active role in securing measures to protect occupational health and safety. 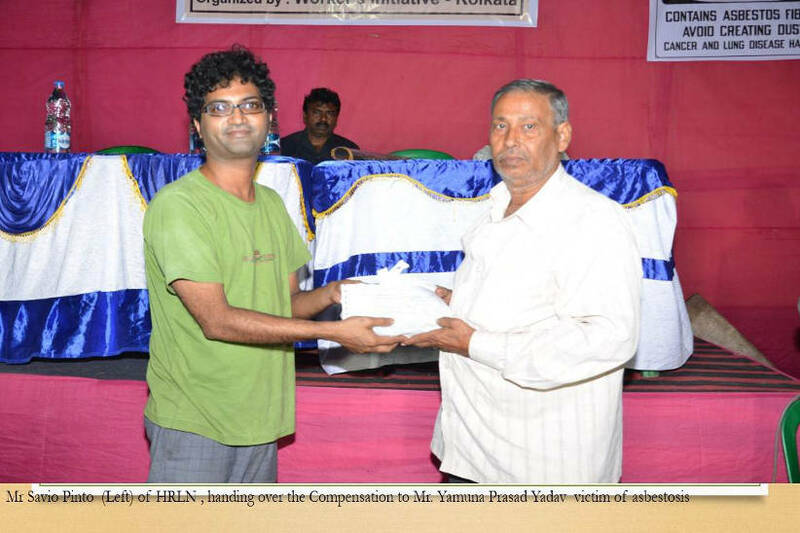 The meeting ended with thanks from the Chair.